Who Deserves to Have an Identity? Who Deserves to Have a Country? The threats raised by the mass migration into Europe rise to the level of the existential. Can a civilization survive the replacement of the people who created it by people of other races, religions, and civilizations? Will Europe remain Europe if she is repopulated by Arabs, Muslims, Asians and Africans? What will hold Europe together? Free trade? The current invasion of Europe by “refugees” from the Middle East, North Africa, and Asia is engineered and enabled by politicians (with the exception of Hungarian Prime Minister Viktor Orban), without the support of Europe’s peoples. That raises the obvious question: Why are European politicians promoting what Buchanan, Orban and any person (whose mind hasn’t been turned into mush by PC propaganda) so clearly see — the systematic destruction, via demographics, of European civilization and its people? One explanation reaches back to the 1920s, to a plan drafted by a bi-racial Austrian-Japanese named Richard Nikolaus Eijiro, Count of Coudenhove-Kalergi (1894-1972), whose parents were the Austro-Hugarian diplomat Heinrich von Coudenhove-Kalergi and Mitsuko Aoyama, the daughter of a Tokyo oil merchant, antiques-dealer, and landowner. Richard Nikolaus, more commonly known as Coudenhove-Kalergi, was a Free Mason and an advocate of racial mixing. He is regarded as a father of the European Union, being the founder and president for 49 years until his death of the first movement for a united Europe, the Paneuropean Union. As Europe finds itself overwhelmed by the incoming hordes of “refugees” and “migrants,” some have turned to what is called the Kalergi Plan to explain why Europe’s political elites encourage and welcome the invasion. Below is an edited translation of an Italian-language article from the blog Identità.com, which is being reblogged and cited by various websites. The article, by Riccardo Percivaldi, is titled “The Kalergi Plan: the genocide of the European peoples“. I’m presenting this on FOTM without commentary, in the interest of information and to provoke discussion. Mass immigration is a phenomenon whose causes are still cleverly hidden by the system and which is falsely represented as inevitable by the multicultural propaganda. With this article we intend to demonstrate once and for all that mass immigration is not a spontaneous phenomenon. What appears to you as inevitable is actually the fruition of a decades-long plan to destroy completely the face of the Old Continent. Few people know that one of the main architects of European integration was also the one with a plan for the genocide of European peoples. He is a dark character whose existence is not known by the masses but whom the powerful consider as the founding father of the European Union. His name is Richard Coudenhove Kalergi. While he was alive, he moved behind the scenes, away from the spotlight, and managed to attract the most important heads of state in Europe, who became his supporters and promoters of European unification. In 1922, he founded the Pan Europa movement in Vienna. Its goal is to bring about a New World Order based on a federation of nations led by the United States. The unification of Europe would be the first step towards a single world government. With the rise of fascism in Europe, the plan suffered a setback, resulting in the dissolution of the Pan-European union is forced to dissolve. After the Second World War, Kalergi redoubled his efforts and, aided by the support of Winston Churchill, the Masonic B’nai B’rith lodge, and major newspapers such as the New York Times, Kalergi succeeded in pushing his plan to the US government. In his book Praktischer Idealismus (Practical Idealism), Kalergi declared that the people of the future “United States of Europe” will not be the original peoples of the Old Continent, but a kind of bestial subhumans made ​​by miscegenation. Kalergi stated in no uncertain terms that you must cross the peoples of Europe with Asian races and color, to create a multiethnic flock without quality and easily controllable by the ruling. Kalergi proclaims the abolition of the right of self-determination and, subsequently, the elimination of nations by means of ethnic separatist movements or mass allogeneic (genetically dissimilar) immigration. In order for Europe to be mastered by the elite, homogeneous peoples are transformed into a mixed race of whites, blacks and Asians. Kalergi characterized these mestizos as cruel and unfaithful, and maintained that the elite must deliberately create the mestizos to achieve their own superiority. The elite will first eliminate democracy — the rule of the people. Next, the elite will eliminate the people via miscegenation, thereby replacing the white race with an easily controllable mestizo race. By abolishing the principle of equality of all before the law, avoiding and punishing any criticism of minorities, and protecting the minorities with special laws, the masses are suppressed. In his time, politicians hearkened to Kalergi — banks and the press were based on his ideas, while U.S. intelligence financed his projects. Europe’s political leaders know that Kalergi was the author of the European Union. Though unknown to the public and untaught in schools, Kalergi is the father of Maastricht and multiculturalism, which indoctrinate Europeans to tolerate and accept subhuman migrants. 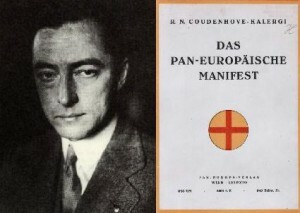 Although no school book talks of Kalergi, his ideas were the guiding principles of today’s European Union. His belief that the peoples of Europe should be mixed with blacks and Asians to destroy European identity and create a single mestizo race, is the basis of our present policy of protecting and integrating minorities. Disguised as humanitarianism, this policy is aimed at the greatest genocide [of whites] in history. Europe’s Coudenhove-Kalergi prize was created in his honor. Every two years, Europeans who excelled in pursuing Kalergi’s criminal plan are awarded the prize, among whom are the likes of [German Chancellor] Angela Merkel and Herman Van Rompuy [former Prime Minister of Belgium and the first President of the European Council]. [White] genocide is also the basis of the UN’s welcoming policy toward millions of immigrants to compensate for Europe’s low birth rate. According to a UN report released in January 2000, entitled “Replacement Migration: a solution to declining and aging populations,” Europe would need 159 million immigrants by the year 2025. One wonders how it was possible to make such an accurate estimate if immigration was not a well-rehearsed plan. Certainly, Europe’s low birth rate can easily be reversed with appropriate measures to support families. It is equally clear that the genetic heritage of Europe cannot be protected by introducing nonEuropean migrants. On the contrary, mass immigration will only accelerate the disappearance of Europeans. The sole purpose of mass immigration, therefore, is to completely denature a people, turning them into a collection of individuals without any ethnic, historical and cultural cohesion. In short, the Kalergi Plan has been and still is the foundation of the official mass immigration policies of European governments, at the cost of the genocide of the peoples of Europe. If we look around Europe, we can see that the Kalergi Plan seems to be fully realized. We are facing a “terzomondializzazione” or Third Worldization of Europe — a “New Civilization” supported by multicultural missionaries, formed from forced mass immigration of hordes of Africans and Asians. Each year, miscegenation and mixed marriages produce thousands of new individuals of mixed race — the “sons of Kalergi”. Under the media’s dual pressure of misinformation and the propaganda of humanitarianism, Europeans are taught to deny their origins, to deny their ethnic identity. Advocates of Globalization strive to convince us to give up our identity as a progressive and humanitarian act and to think that holding onto our ethnic and cultural identity is “racism” because they want to make us all into blind consumers. In these times, it is more necessary than ever that we expose the lies of the system so as to rekindle the spirit of rebellion in Europe. Integration is tantamount to genocide. We have no choice but to rebel for the alternative is ethnic suicide. Author Poor DickPosted on April 27, 2018 June 21, 2018 Categories Cultural MarxismTags 2015 refugee crisis, conspiracy, Culture War, EU/Eurozone, Europe's refugee crisis, George Soros, Islam, Judaism/Jews, Kalergi Plan, Liberals/Democrats/Left, Middle East, New World Order, Patrick Buchanan, Practical Idealism, Praktischer Idealismus, Race, Riccardo Percivaldi, Richard Nikolaus Coudenhove-Kalergi, Viktor Orban, war on Christianity and tagged Can Europe Survive This Invasion?Leave a comment on Who Deserves to Have an Identity? Who Deserves to Have a Country? This video opens with Wesley Clark, Four-Star General, U.S. Army (Ret. ), and former NATO Supreme Allied Commander, Europe (1997 — 2000) speaking of being informed at a Pentagon visit in the weeks after 9/11 about the proposed implementation of the G.W. Bush administration’s Project for the New American Century. This plan, he learned from a Three-Star General of the Joint Chiefs of Staff, included attacking and destroying the governments in seven countries in five-years — Iraq, Syria, Lebanon, Libya, Somalia, Sudan, and Iran. The Neoconservative Wolfowitz Doctrine written in 1992, and the resultant Project for the New American Century manifesto written in 2000 laid out plans for foreign nation destabilization and nation-building by America. Fully implementing the plans required that a Neoconservative administration gain the White House in 2001, and for a nationally galvanizing event like “a new Pearl Harbor” to occur, which was realized with the highly suspicious attacks of September 11, 2001. The Republican instigated “Brooks Brothers Riot” [http://youtu.be/eR5V7cjpycw – beginning a 02:40] that utilized planted Republican staff members posing as Florida residents during the 2000 election recount, successfully stopped the recount and allowed the Supreme Court to appoint George W. Bush as the President of the United States even though Al Gore would have won the recount. This “riot” allowed the Neoconservative administration to begin implementing their Project for the New American Century goals. In 1965, the Vietnam War was being expanded in many of the same ways our wars in the Middle East and Afghanistan War are being expanded today. At the time, the founder of The John Birch Society, Robert Welch tried to educate the American people on the real reason we were at war in Vietnam and why it should be resisted. His insights remain applicable today. Looking at the global political landscape over the last month, two trends are becoming more apparent. The infamous military and economic power at America’s disposal is declining, whereas in the multipolar field, an acceleration has occurred in the creation of a series of infrastructures, mechanisms and procedures to contain and limit the negative effects of America’s declining unipolar moment. This series of three articles will focus firstly on the military aspect of these ongoing changes, then the economics at play, and finally, how and why smaller countries are transitioning from the unipolar camp to the multipolar field. One of the most tangible consequences of the decline of US military power can be observed in the Syrian conflict. Over the past few weeks, the Syrian Arab Army (SAA) and its allies have completed the historic and strategic liberation of Deir ez-Zor, a city besieged for more than five years by Islamists belonging to Al Qaeda and Daesh. The focus has now shifted to the oilfields south of the liberated city, with a frantic rush by both the US-supported Syrian Democratic Forces (SDF) and the SAA to free territories still held by Daesh. The final goal is to claim Syria’s resources and strengthen a weak US position (the US is not even part of the Astana peace talks) in future negotiations concerning the country’s future. To understand how much the US dream of partitioning Syria is failing, one only need note repeated US failures as seen in the liberation of Aleppo and then Deir Ez-Zor, and now the crossing of the Euphrates river. In spite of American intimidation, threats, and sometimes even direct aggression, the Syrian army continued to work against Daesh in the province of Deir Ez-Zor, advancing on oil rich sites. Thanks to the protection given by the Russian Federation Air Force during the conflict, Damascus has obtained a protective umbrella necessary to withstand attempts by the US of balkanize the country. Further confirmation of Washington’s failed strategy to divide the country a la Yugoslavia appears evident from the strategic realignment of the most loyal allies of Washington in the region and beyond. In the course of the last few weeks, several meetings have taken place in Astana and Moscow between the likes of Putin and Lavrov with their Turkish, Saudi, and Israeli counterparts. These meetings outlined the guidelines for Syria’s future thanks to Moscow’s red lines, especially regarding Israel’s desire to pursue regime change in Syria and an aggressive attitude towards Iran. Even the most loyal allies of the United States are beginning to plan a future in Syria with Assad as president. US allies have started showing a pragmatic shift towards a reconciliation with the factions that are clearly winning the war and are going to call the shots in the future. The long-held dreams and desires of sheikhs (Saudi-Qatar) and sultans (Erdogan) to reshape Syria and the Middle East in their image are over, and they know it. Washington’s allies have been let down, with the US incapable of keeping its promises of fulfilling a regime change in Damascus. The consequences for the US have just begun. Without a military posture capable of bending adversaries and friends to her will, the US will have to start dealing with a new reality that involves compromise and negotiation, something the US is not accustomed to. An example of what can happen if Washington decides to go against a former friend can be seen with the Gulf Crisis involving Qatar. Since the beginning of the aggression against Syria, the small emirate has been at the center of plots and schemes aimed at arming and financing jihadists in the Middle East and Syria. Five years later, after billions of dollars spent and nothing to hold onto in Syria, the Gulf Cooperation Council, as expected, has plunged into a fratricidal struggle between Qatar and other countries like Saudi Arabia, Kuwait, UAE and Egypt. The latter accuse Doha of funding terrorism, an undeniable truth. But they omit to acknowledge their own ties to the jihadists (Egypt in this framework is excluded, fighting continually with terrorists inspired by the Muslim Brotherhood in the Sinai), showing a hypocrisy that only the mainstream media can rival. The consequences of Riyad’s actions against Doha, backed up by a large part of the American establishment, seems, almost six months later, to have finally pushed Qatar and Iran together, reopening diplomatic ties….. Investigative reporter Dilyana Gaytandzhieva authored a bombshell report for Trud Newspaper, based in Sofia, Bulgaria, which found that an Azerbaijan state airline company was regularly transporting tons of weaponry to Saudi Arabia, United Arab Emirates (UAE), and Turkey under diplomatic cover as part of the CIA covert program to supply anti-Assad fighters in Syria. Those weapons, Gaytandzhieva found, ended up in the hands of ISIS and al-Qaeda terrorists in Iraq and Syria. While it’s long been understood that the US-Gulf-NATO coalition arming rebels inside Syria facilitated the rapid rise of the Islamic State as the group had steady access to a “jihadi Wal-Mart” of weapons (in the words of one former spy and British diplomat), the Trud Newspaper report is the first to provide exhaustive documentation detailing the precise logistical chain of the weapons as they flowed from their country of origin to the battlefield in Syria and Iraq. Gaytandzhieva even traveled to Aleppo where she filmed and examined labeled weapons shipping containers held in underground jihadist storehouses. The Bulgaria-based journalist obtained and published dozens of secret internal memos which were leaked to her by an anonymous source as part of the report. The leaked documents appear to be internal communications between the Bulgarian government and Azerbaijan’s Embassy in Sofia detailing flight plans for Silk Way Airlines, which was essentially operating an “off the books” weapons transport service (not subject to inspections or tax under diplomatic cover) for the US Special Operations Command (USSOCOM), Saudi Arabia, Israel, Germany, Denmark, and Sweden. Silk Way Airlines has been the subject of other recent investigations involving weapons supplies for the Saudi war on Yemen. In addition, the military monitoring site Balkan Insight has exposed similar weapons cargo flights in and out of neighboring Serbia. But perhaps the more explosive finding involves private American companies contracting with the US government to help train and equip militants in Syria. An investigative series by Buzzfeed – the first of which was published in 2015 – named military contractor Purple Shovel LLC as the recipient of two no-bid contracts totaling more $50 million as part of the US train and equip program for Syria. Gaytandzhieva’s report definitively links Purple Shovel and other private American military contractors to the Azerbaijan Silk Way Airlines shipments. One leaked memo includes a cargo manifest for multiple tons of anti-tank grenades purchased in Bulgaria by Purple Shovel which were ostensibly designated for the official consignee – the Ministry of Defense of Ajerbaijan – but which never made it to Ajerbaijan. The documents, however, reveal that the military cargo was offloaded at Turkey’s Incirlik air base, which is one of the US and NATO’s main command centers for covert operations in Syria. Gaytandzhieva said on Thursday in a tweet that she was fired from her job at Trud after she was interrogated by the Bulgarian national security which tried to find out her sources. She said she first got suspicious of the weapons transferred to Syria when she found Bulgarian-made weapons at the hands “terrorists” in Aleppo while reporting on the Syrian war there. She said that she then traced those weapons to its Bulgarian manufacturer only to find out that those weapons were legally exported to Saudi Arabia, which in turn supplied it to “terrorists” in Syria. Tracking weapons from Eastern Europe to Syrian al-Qaeda: December 2016 Bulgarian news broadcast by Dilyana Gaytandzhieva. Brief English commentary begins at 1:00 mark. The report investigates Bulgarian origin rockets and weaponry said to have been in possession of Nusra Front (AQ in Syria). Leaked documents would later confirm Bulgarian weapons shipped to Saudi Arabia as part of the covert Syria program. The CIA program relied heavily on US ally Saudi Arabia to arm anti-Assad jihadists, and while it appears that the White House recently ended the CIA side of things, there’s no evidence to suggest that Saudi Arabia or other participating allied countries ever ceased or even slowed their part of the operations. Also, given that both the CIA and Pentagon contract with private firms acting as middle men to get weapons to the Syrian battlefield, it is uncertain if all aspects of the CIA program have really been shut down. Historically, the CIA has sometimes farmed out legally questionable activities to private contractors for the sake of ‘plausible deniability’. Furthermore, the Pentagon side of the program, which supplies Kurdish and Arab groups in the Syrian Democratic Forces (SDF) appears to be ramping up of late. Given the latest development of Trud Newspaper firing its own journalist and Bulgarian authorities attempting to locate her sources, it is entirely possible and likely that pressure is building for Trud to remove the story from its website. The new Al Jazeera story has brought fresh international attention to Gaytandzhieva’s findings, which is sure to increase the controversy. Below are excerpts from the original Trud report with images of select leaked documents. The original report contains dozens of downloadable leaked memos which were translated with contents summarized by Dilyana Gaytandzhieva. According to these documents, Silk Way Airlines offered diplomatic flights to private companies and arms manufacturers from the US, Balkans, and Israel, as well as to the militaries of Saudi Arabia, UAE, and US Special Operations Command (USSOCOM), and the military forces of Germany and Denmark in Afghanistan and of Sweden in Iraq. Diplomatic flights are exempt of checks, air bills, and taxes, meaning that Silk Way airplanes freely transported hundreds of tons of weapons to different locations around the world without regulation. They made technical landings with stays varying from a few hours to up to a day in intermediary locations without any logical reasons such as needing to refuel the planes. Among the main customers of the “diplomatic flights for weapons” service provided by Silk Way Airlines are American companies, which supply weapons to the US army and US Special Operations Command. The common element in these cases is that they all supply non-US standard weapons; hence, the weapons are not used by the US forces. According to the register of federal contracts, over the last 3 years American companies were awarded $1billion contracts it total under a special US government program for non-US standard weapon supplies. All of them used Silk Way Airlines for the transport of weapons. In some cases when Silk Way was short of aircrafts due to a busy schedule, Azerbaijan Air Force aircrafts transported the military cargo, although weapons never reached Azerbaijan. The documents leaked from the Embassy include shocking examples of weapon transport. A case in point: on 12th May 2015 an aircraft of Azerbaijan Air Forces carried 7.9 tons of PG-7V and 10 tons of PG-9V the supposed destination via the route Burgas (Bulgaria)-Incirlik (Turkey)-Burgas-Nasosny (Azerbaijan). The consignor was the American company Purple Shovel, and the consignee – the Ministry of Defense of Azerbaijan. According to the documents, however, the military cargo was offloaded at Incirlik military base and never reached the consignee. The weapons were sold to Purple Shovel by Alguns, Bulgaria, and manufactured by Bulgaria’s VMZ military plant. According to the federal contracts registry, in December of 2014 USSOCOM signed a $26.7 million contract with Purple Shovel. Bulgaria was indicated as the country of origin of the weapons. On 6 June 2015, a 41-year old American national Francis Norvello, an employee of Purple Shovel, was killed in a blast when a rocket-propelled grenade malfunctioned at a military range near the village of Anevo in Bulgaria. Two other Americans and two Bulgarians were also injured. The US Embassy to Bulgaria then released a statement announcing that the U.S. government contractors were working on a U.S. military program to train and equip moderate rebels in Syria. Which resulted in the U.S. Ambassador to Sofia to be immediately withdrawn from her post. They very same weapons as those supplied by Purple Shovel were not used by moderate rebels in Syria. In December of last year while reporting on the battle of Aleppo as a correspondent for Bulgarian media I found and filmed 9 underground warehoused full of heavy weapons with Bulgaria as their country of origin. They were used by Al Nusra Front (Al Qaeda affiliate in Syria designated as a terrorist organization by the UN). Besides the USA, another country that has purchased huge quantities of Eastern-European weapons and exported them on Silk Way Airlines diplomatic flights is Saudi Arabia. In 2016 and 2017, there were 23 diplomatic flights carrying weapons from Bulgaria, Serbia and Azerbaijan to Jeddah and Riyadh. The consignees were VMZ military plant and Transmobile from Bulgaria, Yugoimport from Serbia, and CHIHAZ from Azerbaijan. The Kingdom does not buy those weapons for itself, as the Saudi army used only western weapons and those weapons are not compatible with its military standard. Therefore, the weapons transported on diplomatic flights end up in the hands of the terrorist militants in Syria and Yemen that Saudi Arabia officially admits supporting. On 5 March 2016, an Azerbaijan Air Force aircraft carried 1700 pcs. RPG-7 (consignor: Ministry of Defense of Azerbaijan) and 2500 pcs. PG-7VM (consignor: Transmobile Ltd., Bulgaria) for the Defense Ministry of Saudi Arabia. Diplomatic flights from Burgas Airport to Prince Sultan Airport on 18 and 28 February 2017 each carried a further 5080 psc. 40 mm PG-7V for RPG-7 and 24 978 psc. RGD-5. The weapons were exported by Transmobile, Bulgaria to the Ministry of Defense of Saudi Arabia. Such munitions and RPG-7 originating in Bulgaria can often be seen in videos filmed and posted by the Islamic State on their propaganda channels. The 41.2-ton cargo from Baku and Belgrade included: 7.62 mm cartridges, 12 pcs. sniper rifles, 25 pcs. M12 “Black Spear” caliber 12.7x108mm, 25 psc. RBG 40×46 mm/6M11, and 25 pcs. Coyote machine gun 12.7×108 mm with tripods. The same heavy machine gun appeared in videos and photos posted online by militant groups in Idlib and the province of Hama in Syria a few months later. The aircraft also carried: 1999 psc. M70B1 7.62×39 mm and 25 psc. M69A 82 mm. On 26 February 2016, a video featuring same M69A 82 mm weapons was posted on YouTube by a militant group calling itself Division 13 and fighting north of Aleppo. Interestingly, the aircraft that carried the same type of weapons landed in Diyarbakir (Turkey), 235 km away from the border with Syria. Another type of weapon, RBG 40 mm/6M11, which was from the same flight and supposedly destined for Congo too, appeared in a video of the Islamic Brigade of Al Safwa in Northern Aleppo. After Turkey, the aircraft landed in Saudi Arabia and remained there for a day. Afterwards it landed in Congo and Burkina Faso. A week later, there was an attempted military coup in Burkina Faso. Full report and downloadable copies of leaked documents are also available here. (March 23, 1991)–Sources in Dhahran today revealed what might have been the true reason for the seemingly illogical and apparently suicidal attack by Iraqi troops on the deserted city of Al-Khafji, located just 12 miles south of the Kuwaiti border. The report indicates that the top priority objective of the Iraqi strike across the border was a successful attempt to destroy a small, portable FM radio station that had been installed on the roof of the tallest building in the town of Al-Khafji by the U. S. Defense Department’s PsyOps Branch. With the destruction of Saddam Hussein’s military command and control system, communications with Iraqi troops in Kuwait are now largely carried out in a very primitive manner by utilizing Iraq’s commercial FM radio stations located in the small Iraqi towns adjacent to Kuwait’s western border. Military orders are encoded and then transmitted by Baghdad’s military FM radio station YIHS. These signals are received and re-broadcast, in turn, by designated FM stations located between Baghdad and the Kuwaiti border until the programming arrives at the designated “control” station of the day which then broadcasts directly to the troops in Kuwait on exactly 100.00 MHz (megahertz), which is continuously monitored by all. In order to nullify this Iraqi military line of communications (LOC), the U. S. PsyOps organization attached to the U. S. Central Command in Dhahran installed a portable FM broadcast transmitter, a gasoline-electric generator and a continuous tape recording system on top of the tallest building in the deserted city of Al-Khafji. The station transmitted on 100.00 MHz and its power output was adjusted to cover up the transmission of the Iraqi station operating on exactly the same frequency. The clandestine station programming consisted of patriotic and religious music and intentionally vague, confusing and contradictory military orders and information to the Iraqi soldiers in the Kuwait i Theater of Command (KTO). The size and power of enemy forces was always intentionally exaggerated. Surrender was encouraged. ALTHOUGH COMPLETELY SILENT TO THE HUMAN EAR, THE NEGATIVE VOICE MESSAGES PLACED ON THE TAPES ALONGSIDE THE AUDIBLE PROGRAMMING BY pSYoPS PSYCHOLOGISTS WERE CLEARLY PERCEIVED BY THE SUBCONSCIOUS MINDS OF THE iRAQI SOLDIERS AND THE SILENT MESSAGES COMPLETELY DEMORALIZED THEM AND INSTILLED A PERPETUAL FEELING OF FEAR AND HOPELESSNESS IN THEIR MINDS. IT WAS NECESSARY FOR THE IRAQI TANK COMMANDERS OR ANOTHER CREW MEMBER TO LISTEN TO THE FM STATION 24 HOURS EACH DAY FOR QUICKLY CHANGING DEPLOYMENT ORDERS. THEY WERE BEING EXPOSED TO THE “SILENT SOUNDS” DURING THE SAME LISTENING PERIODS. Grant Williams, author of “Things That Make You Go Hmm…” offered the most comprehensive analysis yet of the rise and inevitable fall of the petrodollar (and implicitly US hegemony). In the following presentation, from Mines & Money Conference in London in December 2016, Williams focuses on gold’s performance in 2016, the reaction to Donald Trump’s election and joins a series of dots that may lead to the end of the petrodollar system and a new place for gold in the global monetary system. The story begins in the 1970s when Henry Kissinger and Richard Nixon struck a deal with the House of Saud — a deal which gave birth to the petrodollar system. The terms were simple The Saudis agreed to ONLY accept U.S. Dollars in return for their oil and that they would reinvest their surplus dollars into U.S. treasuries. In return, the U.S. would provide arms and a security guarantee to the Saudis who, it has to be said, were living in a pretty rough neighborhood.